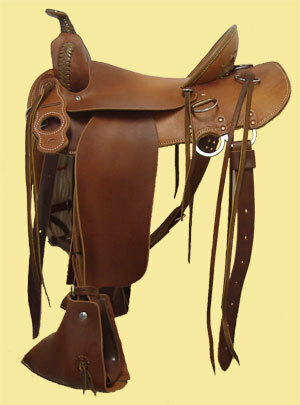 While it was originally designed as a hunting saddle. The Ericksen Mountain Saddle has proven to be outstanding as a trail saddle, handy as a ranch saddle, and a comfortable day in, day out riding saddle. We also have a very good mule fit. All of our saddles are handmade from Hermann Oak skirting leather. They feature braided rawhide on the horn and swells laced to match, a rawhide cantle binding, and the slots in the cantle are lined with rawhide as well. It’s durable and looks good. There are seven large 1½ inch Dee rings attached with rawhide so there are ample places to attach rifle scabbards, cameras, tie ropes, cruppers, britchin, or whatever in a secure manner. ​We cut slots in the cantle which we call “Santa Fe” slots, after the old mountain man type saddle. These are good for tying on big game or extra packs. ​We use only “Ralide” trees in our saddles. We hand-shape the bars to fit horses and mules and hand shape the seat to fit most people. We fit 90% of Mules and 80% of horses. It is an Improved Association style with a semi-quarter horse spread to the bars. We offer 4 standard seat lengths: 14”, 15”, 16”, & 17”, with your choice of 4” cantle or I can custom build one up to a 5”. We also offer 12", 13", & 18" on a custom basis. We offer custom tooling for an additional cost. See our products page for more information.